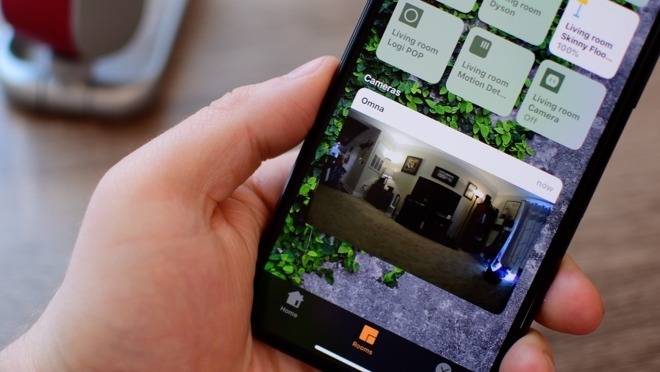 Apple's Home app is the central focal point of a user's HomeKit network, with it used to control automation functions and to remotely change settings and modes on a wide variety of compatible network-connected devices. It is a fairly straightforward system once it is set up, and could even be managed from the compact screen of an Apple Watch if required. Home is able to divide up devices in a Smart Home into "Rooms," giving users a quick and easy way to sort through their connected elements, and to trigger multiple items as a group. While using Rooms is simple, Apple believes the concept could be widened further. In a patent application published by the U.S. Patent and Trademark Office on Thursday titled "Using in-home location awareness," Apple suggests a future where users could be provided more items to control in the Home app, with it automatically populating items on the screen depending on the mobile device's physical location, and without needing to select a specific room. 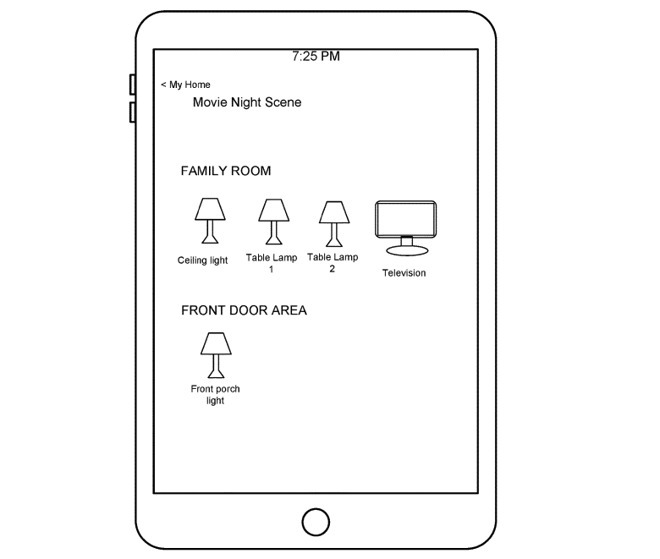 An example illustration from the patent application showing additional items appearing in the Home app. Apple notes that users perform the same or repeated actions with devices while in a particular location, such as closing the garage door from the kitchen when they return home, or changing the temperature on a thermometer while in the living room. However, since an item like a garage door wouldn't necessarily be considered part of a kitchen, it may not be included within a designated kitchen "room." 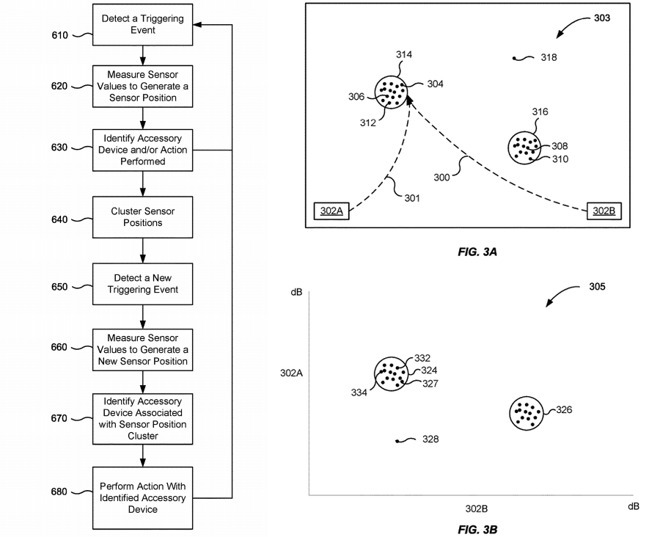 To solve this, the patent application suggests determining the physical location of the controlling device, and presenting items that are typically interacted with by the user while in that particular position. The method involves the collection of data relating to various signals detected when users perform actions, such as MAC addresses of wirelessly-networked devices, Bluetooth device addresses and that device's signal strength, IP addresses, universally unique identifiers (UUID) and truncated UUIDs. In effect, by knowing what items it can sense and the signal strength, the mobile device can determine physically where it is within a home, and in turn which room it is located within. If the mobile device knows it is within range of accessories in a general location, it could also assume the user is in a usual place for specific interactions, if they have previously been performed in that area. Once it detects the user is in a specific place, the Home app could then automatically offer up control of the usually-controlled items to the user. The decision to provide more immediate access to certain device controls could also be influenced by other elements, such as if the user is near to a location rather than within it. Light sensors, temperature sensors, and weather sensing could also play a part in whether or not to offer controls, such as the system only automatically offering control of external lights if a light sensor says it's dark, or the thermostat could be offered up if a temperature sensor says it's cold. As with other patents and applications, the publication of such filings is not a guarantee that the concepts described will make an appearance in future products or services, but do indicate where has recently put effort into research and development. In this case, since Apple has the Home app already in existence, and does not require the need for additional hardware, it is entirely plausible for the features in the patent application becoming a reality in a future update. HomeKit already includes support for geofencing, which can enable actions to be performed when a user is within or out of range of the home. For iOS 11, multi-person geofencing was introduced, allowing for conditional triggers to be applied if part or an entire group is out of the home, such as turning off all lights if the house is detected as empty. It is also logical that, if Apple were able to implement location tracking in a home, it could also feasibly add hyper-local geofencing at the same time. This could take the form of lights turning on automatically when a user is in a particular room, or turning off fans or other devices if the user moves to a different floor. One of the more recent changes made to HomeKit is the introduction of support for Siri Shortcuts, which allows users to enable various HomeKit routines via a custom Siri command.